This truly is a Blue Bird of Happiness. Almost without exception, he brings a broad smile to people's face when they see him. Fun and whimsical. There's no place like the Caribbean with it's bright colored houses and palms blowing in the trade winds. 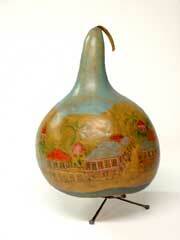 This gourd seeks to capture the flavor of Fredericksted in St. Croix, but could be any one of a dozen Caribbean towns. 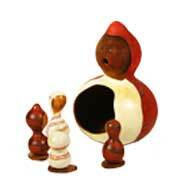 The story teller doll is an integral part of Southwestern Indian culture. The elders of the tribe pass on stories of creation, life, and death to children who then pass the tales on to their children. In all cultures, it is the older members who pass on traditions and values to the younger. 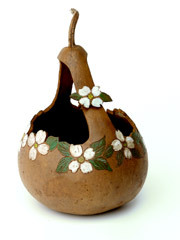 This gourd is an adaptation of the story teller doll. 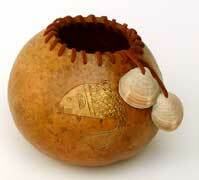 Fish are a recurring theme in Native American designs. This fish is an adaptation of a Mimbres Indian motive. 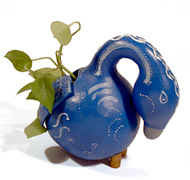 A basket with a touch of spring will brighten up a table or hang in a kitchen window. The bright colors of fall decorate this basket to provide a place for a fall “bouquet” of leaves or to keep spare keys or change. Baskets can be hung or sit on a table or counter. The “lace” design lends an air of delicacy and it's free form design is fun to create. The distinctive architecture of tobacco barns are a familiar sight on Maryland farms but as tobacco production wanes, the wood-frame barns are falling into disrepair. Preservation Maryland is working to preserve as many of these relics of a past way of life as they can.